2018 Oscars Week Photos, News, and Videos | Just Jared Jr.
Madelaine Petsch was a beauty in black at the 2018 Women In Film Pre-Oscar Party! 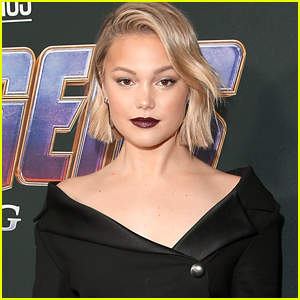 The Riverdale actress helped honor female Oscar nominees at the event held at Crustacean on Friday (March 2) in Beverly Hills, Calif.
She paired her jumpsuit with dark red nails, letting her wavy locks flow freely. Madelaine was joined by Kat Graham, looking gorgeous in a white top, high-waisted black pants with a bow design, and rectangular shades, and Julianne Hough, who donned a colorful floral top and showed off her new red hair. Also in attendance were Anya Taylor-Joy, Alexandra Shipp, Lea Michele, Taylor Hill, and Romee Strijd. FYI: Madelaine is wearing an INGIE Paris jumpsuit. Kat is wearing George Keburia with Alexandre Birman shoes and a Ferragamo bag. Julianne is wearing a Monique Lhuillier bodice and pants with Aldo shoes and an L.K.Bennett clutch. Anya is wearing a Dolce&Gabbana dress. Alexandra is wearing a Jennifer Meyer ring. Lea is wearing a DVF top, Styland trousers, Chloe Gosselin shoes, Yael Sonia earrings, and Dean Davidson rings. Jake Paul and his “wife” Erika Costell teamed up for the WME Talent Agency Party! The social media stars were spotted at the event ahead of the 2018 Academy Awards on Friday night (March 2) in Beverly Hills, Calif.
Jake donned a beige jacket, cropped navy pants, furry green Gucci loafers, and orange sunglasses, while Erika sported a blue and beige patterned mini dress. Jake snapped some pics while holding a pizza box on his way out! ICYMI, find out why the two are currently taking a break from YouTube. 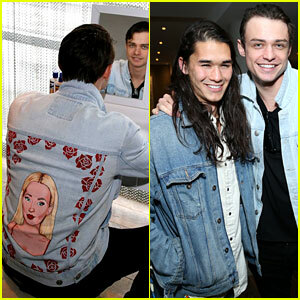 Thomas Doherty loves his girlfriend Dove Cameron so much, he wore a jacket with her face on it! The actor stepped out for Kari Feinstein’s Pre-Oscars Style Lounge on Friday (March 2) at the Andaz in Hollywood. The denim jacket, made for him as a gift from a fan, featured Dove‘s face surrounded by red roses and wearing bold red lipstick and a matching thin-strapped top. The two recently celebrated their one-year anniversary. See her sweet post here. Thomas was joined at the event by his Descendants 2 co-star Booboo Stewart, as well as Willow Shields, Mahogany Lox, Jean-Luc Bilodeau, and Chelsea Hobbs.